Customize email confirmations for gifts, payments, and registrations! Within your forms manager, you can create customized emails triggered by form submissions. NOTE: This feature is managed through Forms. It won’t be applied universally across all giving/payment forms. Instead, you have total control over when and what messages are sent! Step 1. Navigate to your manager dashboard. Click on Forms tab in the menu on the left side of your screen. Step 2. Create a new form or edit an existing form. Step 3. Click Form Properties in the bottom left corner. Step 4. In your Form Properties window, navigate to the Email tab. Click the green Add Email button. 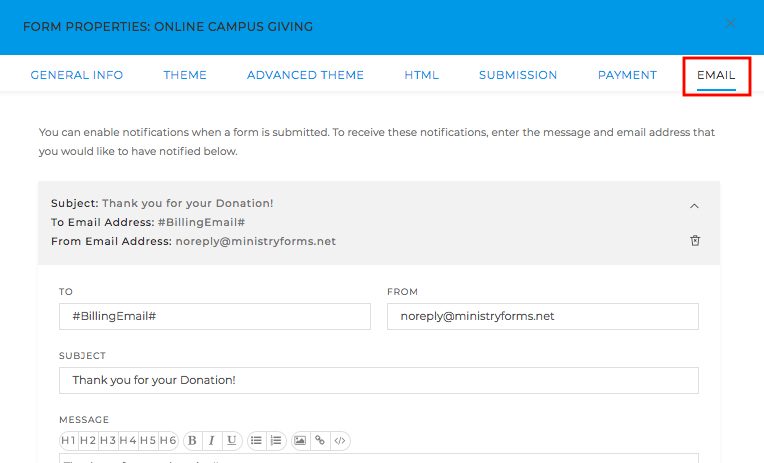 *Giving forms automatically pull up a gift confirmation template for you to edit. Step 5. Complete the fields to set up your custom email! Input specific recipient email address(es) or a personalization placeholder (more below). 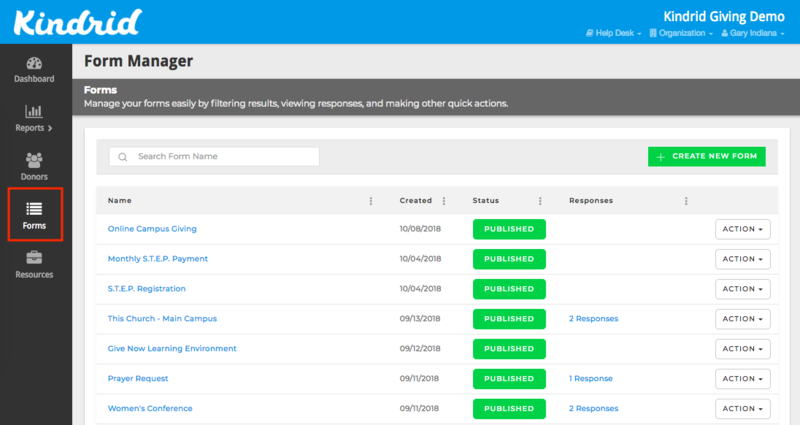 Giving forms populate the TO field with a billing email placeholder; the email notification will automatically send to whoever submitted the form. Enter a sender email address. This is who the email will come from and any replies will go to this address. Many organizations input a noreply email or even a pseudo-email with a name relevant to the form. Write the email's subject line. This becomes the email body. Input your customized message here! For more personalization, use placeholders to input values from form fields. Step 6. When you're done crafting your email, exit out of the Form Properties window. Step 7. Click Save, then Save and Publish to make your changes live! You can use placeholders to personalize your emails with any known field values, like the name or email of the person who submitted the form. Add a placeholder for any field in your form. In order for placeholders to work properly, the form field and the placeholder must match exactly. Can I create multiple email confirmations/notifications for one form? Yes! After creating your first email notification on a form, click the green Add Email button again before saving. 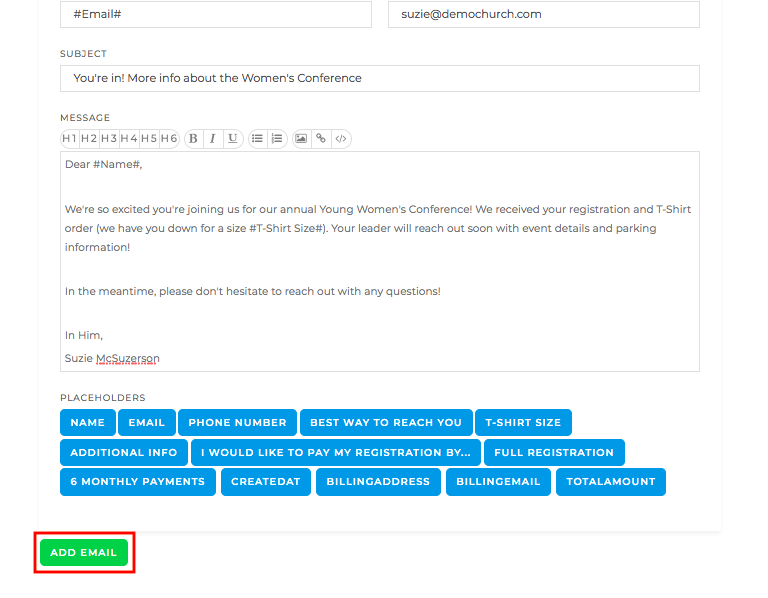 Here's an example of using multiple email notifications for one event registration form. 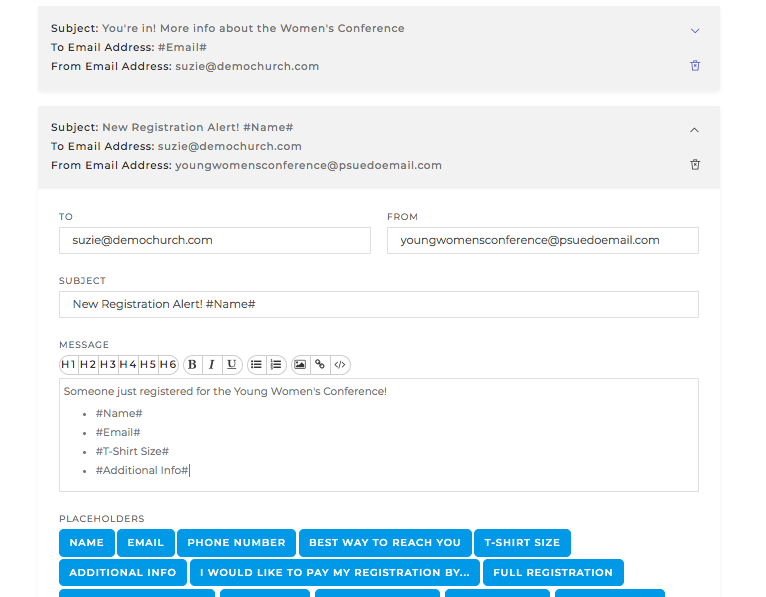 Suzie created a form email to confirm a user's successful registration and provide more event information. She clicked Add Email to add another form email. This time, she created an email to notify herself of a new registration. Can we send different email confirmations/notifications for different forms? Yes! Your managers can create unique email notifications for each form. Because this feature is managed through Forms, it won’t be applied universally across all giving/payment forms. Instead, you have total control over which forms send email notifications, what the email says, and to/from whom it sends!